The Master’s Degree Course in Medienmanagement (Media Management) covers a field in which Economics, Social Sciences and Media Studies intersect. This is why both tuition and research are characterised by a transdisciplinary and multifaceted approach, which the Faculty of Media regards as an essential response to the profound changes currently taking place in terms of media products, media enterprises and economic conditions. The four-semester Master’s Degree Course in Media Management gives students a basic grounding in economics. Using a project-based approach, the study programme introduces participants to current economic issues, both theoretical and practical. In this way, key subjects of study such as media products, media enterprises, media markets and media consumers are considered not in isolation, but within their cultural, political and social contexts. The syllabus design thus addresses the differentiated and increasingly complex demands of management practice. 1. Ideal conditions for study. With an annual intake of around 40 students, the Master’s Degree Course in Media Management offers students a highly personalised and interactive working environment throughout their studies. Members of the teaching staff provide intensive supervision. The lecture theatres and seminar rooms are equipped with the latest in multimedia technology, and students have access to computer pools, workspaces and wireless LAN. The university sees this as an essential and integral part of the Bauhaus tradition. 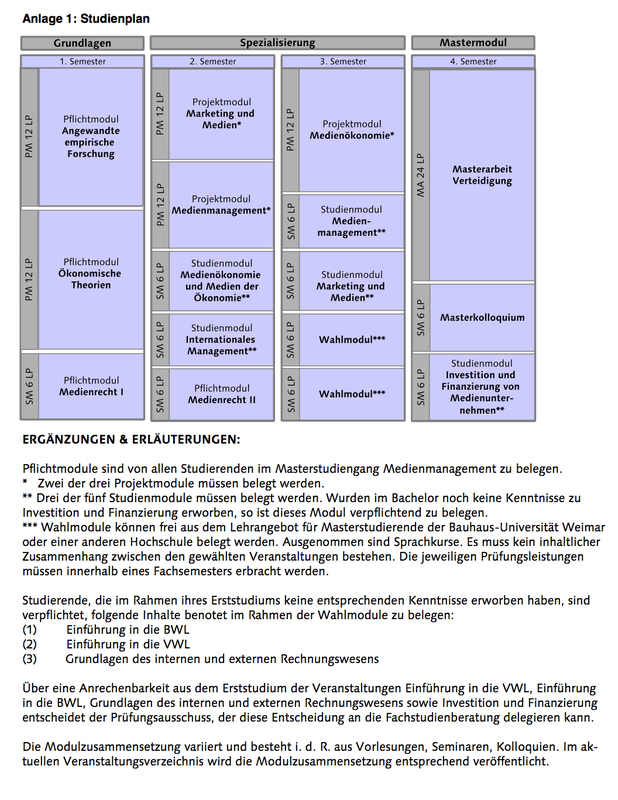 Modularisation allows a number of different courses to be linked to a given topic, which can thus be approached from a variety of perspectives (see course catalogue). This approach, which is based around a combination of formal lectures, group work and case studies, promotes interdisciplinary skills, as well as encouraging independent and innovative thinking. 3. Orientation towards practical experience and research. The professors and other members of the teaching staff ensure that the study programme is regularly supplemented and enriched by guest teachers from both practical and academic backgrounds. Lectures and collaborative projects give students the opportunity to apply their theoretical knowledge in a practical way and to establish important contacts which will provide them with career opportunities when they have completed their studies. The degree course is also research-oriented; lectures and conferences featuring guest speakers are regularly held as a means of stimulating academic ideas. Close collaboration with the neudeli Start-up Hub gives students an insight into the world of start-up businesses. The neudeli team offers advice to students on how to implement their own business ideas, as well as organising seminars and providing them with workspaces and financial support. It has already produced around 40 start-ups, which have successfully established themselves in the marketplace.